Figs figs figs! Here we are again, more than half way through fig week and once again, I’m throwing some goat cheese in the mix. I can’t stop, yo! This is just as easy as the Fig & Goat Grilled Cheese from my previous post. The Rock Star and I had this for dinner last Sunday and it was perfect! The heat of the day had passed and a cool breeze had settled over our yard. The boys were acting abnormally pleasant and we were sipping what will be tomorrow’s cocktail AMAZINGNESS FYI, and just enjoying the moment. The Pasadena Parrots were flying over us in groups headed home for the evening and all was right with The Swearing Mom world. These are the moments, folks. The simple times, the microscopic non-events that make up the summation of a good life. relish them, because they are not unlimited. Place naan on a baking sheet. 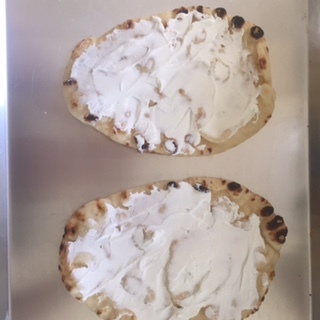 Spread half of the goat cheese onto the naan. 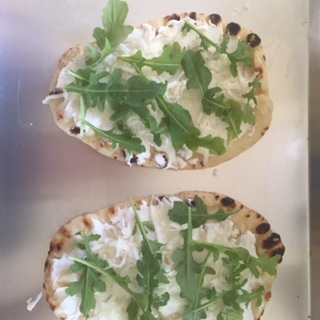 Place 1/2 cup arugula on each flatbread and gently pat into cheese. 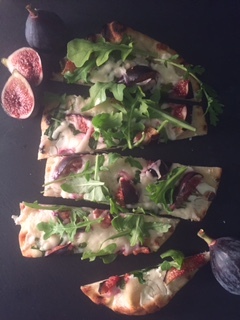 Arrange your fig wedges evenly over the flatbreads. Sprinkle remaining cheese evenly over flat breads and place into a 400 degree oven for about 10 minutes or until cheese is completely melted. Remove from oven, top with remaining arugula and cut into slices or wedges. Serve warm.